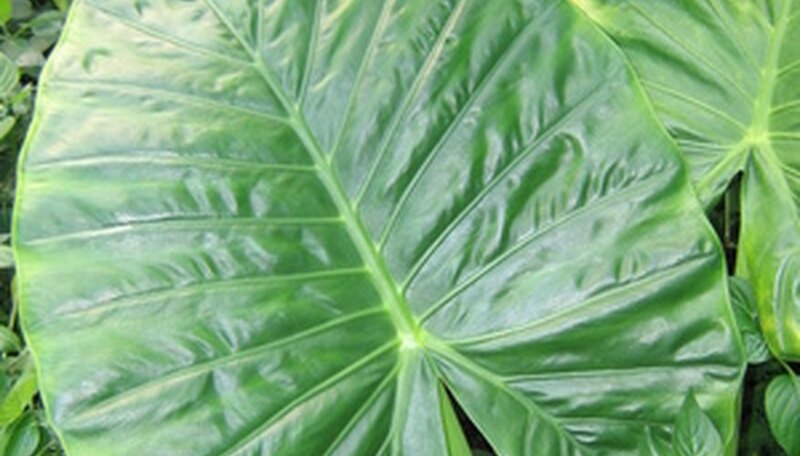 Elephant ears is the common name for cultivars of the Colocasia and Alocasia plants. It was named for the huge heart shaped leaves that resemble an elephant’s ears. The leaves can be as large as 2 feet across and 3 feet long. The plants can grow as high as 8 feet and just as wide. Elephant ears are hardy in USDA Hardiness Zones 8 and warmer and it’s for this reason that many people plant them in pots for indoor house plants. You will need a large sunny space in your home to grow these giants indoors. Choose a location for your container that receives at least six hours of sun each day and stays above 65 degrees. Do not locate the plant near heat or air conditioning vents or near an outside door in the winter. Mix 1 part compost and 1 part peat moss with 2 parts potting soil. Place the container on the drain tray before filled with soil or use a container with an attached drain tray. Fill the container with the soil to within 1 1/2 inches of the top. Plant one to three tubers towards the center of the soil. Colocasia Illustris and colocasia Bblack agic have a joint between the root system and the top growth. The tuber should be planted so the joint is level with the soil line. If the cultivar is a colocasia esculenta or an alocasia macrorrhzia then it will be a very large bulb which should be planted 10 inches deep in the soil with the roots down. Water the plant to completely soak the soil immediately after planting. Keep the soil moist at all times. The elephant ears will sprout and grow between three and eight weeks. Apply a liquid fertilizer high in nitrogen once a month after the plant starts to grow. Stop fertilizing if new foliage stops appearing as the plant may be going into a dormant stage. Follow the manufacturer’s directions on the amount of fertilizer to apply. Supply humidity to the plant by filling a spray bottle with distilled water and spraying when it’s dry indoors. You can also set up a humidifier near the plant if you use central heat or air conditioning that dries out the air. Take the plant outdoors in the summer to get some fresh air. Place it in the shade and slowly move it into the sunlight or it will burn. Make sure to provide plenty of water when it is very hot or windy. Bring the plant back indoors when the temperature starts to drop below 65 degrees.